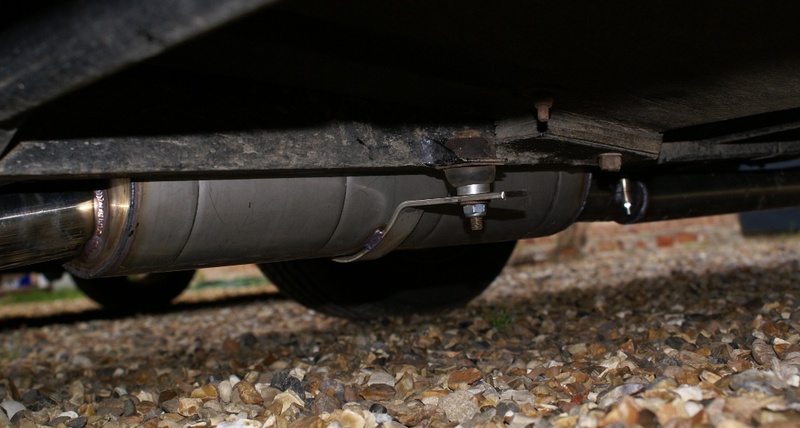 With a tour of France planned and the desire to get the S onto the track I had to do something about the exhaust. A brief history of the standard exhaust is as follows. The service history indicated that there was a crack in the silencer and that this could be welded. Removing the exhaust did reveal a crack at the front close to where the 2 pipes join the main silencer and this was quickly welded up. While the exhaust was off I cut an opening in the top of the rectangular box section and discovered that this was empty. A load of wadding soon filled the void and the top was welded back on. This made a difference but not long later a rattle developed and this turned out to be the baffles in the front oval section that has cracked. These baffles were removed (there was no wadding left) but the side effect was that there was a lot of resonance at cruising speeds. Driving the S for any time meant wearing ear plugs to avoid severe discomfort. It was even worse with the roof fitted and the car was becoming unusable as a result. 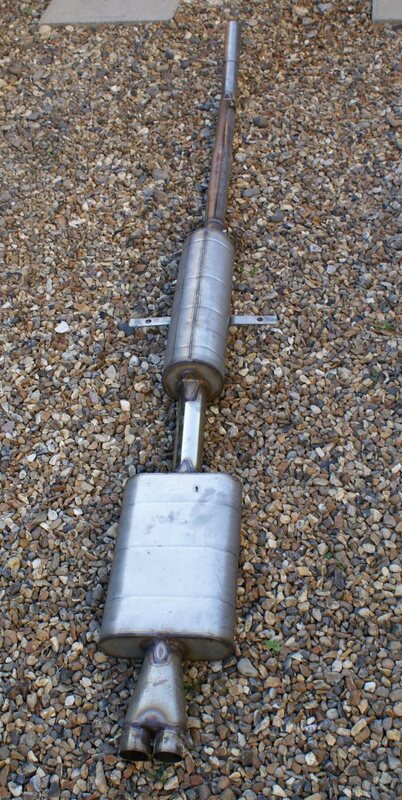 A posting on the S forum on Pistonheads didn't produce any leads for a quiet exhaust so I decided that I'd have to go for a custom exhaust. I popped in to see Steve Harris at Concept Engineering in Wymondham and he had a quick look and was sure he could do something. A couple of weeks later I dropped the car off and it was placed on the ramps. We discussed requirements and what could be done to the chassis to accomodate the silencers and Steve set to work. It was decided that the system would be built as a single 2.5" pipe unit. A 2 x 2" collector was fabricated into the front box and the box itself was made farly wide but short and was designed to fit under the gearbox. The main silencer was cylindrical and fitted where the rectangular one went. There were tweaks to the chassis and pipe to allow for the maximum size silencer to be used. The tail pipe is a single 2.5" outlet and the reason for this was to allow for the fitting of a muffler for track day use. These results were better than I thought possible and I am very happy with the system. The main box showing it fitted into the space in the chassis. The complete system showing the size of the front box. After having the new exhaust fitted I then drove the S to France on a 1806 mile touring holiday. Not once did we find the car noisy and neither Louise or myself needed earplugs so it was money well spent. If you have any questions about the system then feel free to email me. If you want to contact Steve then do a google search for "Concept Engineering Wymondham" and this will pull his contact details. Wymondham is in Norfolk and just a few miles from Lotus Cars.